TO AH (トウアー) is a spoke person for Very Fun Park Exhibition (粉樂町) in Taiwan. I was asked to make TO AH bento box for the Very Fun Park’s 10th Anniversary. 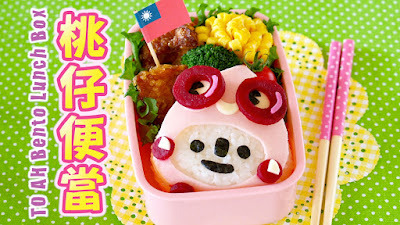 Since it is a meaningful exhibition, I decide to participate as an artist with my creative bento. This character’s name is CHI TOU, which means having fun, nickname TO AH, is created by a Japanese graphic artist, Akinori OISHI (大石曉規). 1. TO AH has very good eyes to discover creative things and beautiful art. 2. Screw driver hands that help locks the art at where it is displayed. 3. Very Active, walk all over the streets and alley to explore the city. 4. Always keep her lovely smile on her face which is perfect 30 degrees. 5. Only wears dark pink. 1. Season the rice with a bit of salt and make a triangular shaped Onigiri rice ball. 2. Cut out ham into a drop shape and cut an oval hole.